At such a crucial moment in the advancement of transgender rights worldwide, it is imperative that the increased visibility of transgender people in the media — especially the mainstream media: television, news, movies, books — demonstrate the diversity of transgender lives: diversity of people, of lives led, and of experiences relevant and irrelevant, however one perceives it, to being trans or gender-nonconforming. That feels like a vital thing to state but the necessity of it is beleaguering. I want to leap right to the part where people across the gender spectrum do not have to waste time defining themselves in relation to established narratives. I want so many stories that when trans children find them, they read them and think they could be a part of any story and not just the one about becoming what is familiar. This sense of exhaustion saturates British writer Juliet Jacques’ memoir, Trans, a staggeringly vulnerable and groundbreaking book. There have been several notable memoirs of gender transition. But unlike these, Trans, adapted from Jacques’ Guardian column that ran from 2010 to 2012, documents the way her development as a person who is transgender occurred simultaneously with her growing awareness of how being visible as a transgender person is a political act of vital consequence. Before her surgery, in a departure from the specific steps frequently associated with transitioning medically, Jacques stops taking hormones. The ambivalence Jacques demonstrates in Trans’ opening pages might puzzle those who are only familiar with the trans narrative as “a mythical hero’s journey,” an approach to transition that Jacques explicitly wanted to counter with Trans. The standardization of a transition story is something Jacques resists when she stops taking her hormones. Instead of fitting her life to established stories, Jacques asserts that a transition is still valid even when it is not about a series of medical and legal checkpoints on the way to have one’s identity recognized. This determination to define herself on her own terms makes Trans unique in the emerging genre of transition memoirs. One particularly powerful aspect of the book is its exploration of the scant, sensational evidence of transgender lives that had penetrated the mainstream media in Jacques’ adolescence. The effects of those representations, which oftentimes exposed the transphobia of the culture that surrounded her, compelled Jacques to write the column that became Trans. We see the back of the woman driving, who speaks in a deep, gruff voice: “Are you here for work or pleasure?” She tells him about the shop “where I get my dresses”; there is laughter on the soundtrack and in our living room . . . I laughed: less than my flatmates, and later. In the afterword, a conversation with novelist Sheila Heti, Jacques specifies that “there are plenty of trans people who are left cold by these things” — by representations of transgender lives in art, particularly works of the avant-garde — “you can probably be trans and never see an Almodóvar film and you’ll be alright.” Trans will resonate with anyone for whom, like for Jacques, art is a lifeline. An important dimension of Trans is the way that it talks back to this media status quo that perpetuates and excuses transphobic rhetoric and depictions of transgender lives. An extension of the column that hatched it, Trans is “aimed at newspaper editors and TV/film commissioners” in order to “encourage them to think differently about what terms were set for discussion of trans lives and politics.” Jacques writes that she wants to demonstrate that the real circumstances of transgender lives are of a greater interest to general audiences than the media, so prone to sensationalism, seems to think. Parts of Trans see Jacques attempting to be a writer — on her own terms, as ever. But by writing her column and Trans, she concedes to the necessity that, as a trans person who wants to write, she must provide her testimonial in the form of a memoir. Jacques bemoans this necessity, that this is the story that is in-demand, and there is so much vitality in that restlessness. Jacques is a writer’s writer. As a piece of literature, Trans is elegant, spare, and subtly devastating. Were it not for the emergence of Jacques’ voice, Trans might seem perfunctory, as tedious and alienating as the events described therein. Her ambivalence towards being political, her acceptance of the Guardian column in the service of her writing career — Jacques is a gloriously human, preternaturally effective writer. She should not have to frame the facts of her life in the service of making readers understand what it is like to be trans. That is one aspect of who she is as a person and an artist. 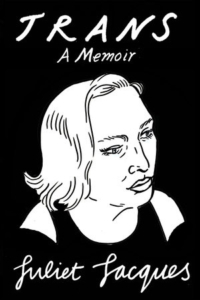 But Jacques has written exactly the kind of book that captures the complexity of this moment: the tension between saying what still seems necessary about transitioning and what Jacques is capable of saying as a writer ignites Trans, and it deserves to be illumined as a key twenty-first century document. I sleep deeply for four hours, then wake, fixated upon the question of inequality. Gradually realizing that I’m in no fit state to resolve this longstanding problem, it takes time to settle back down. I take [sleeping pills] again the following night, and something similar happens: I rise with this singular sensation of disconnect from my body . . . Soon I weep again, through tiredness and pain. I venture into the garden for the first time. Just seeing London life — a tower block, a single car and a pedestrian — makes me realize that soon I’ll be out, with the pain subsiding, and this and the fresh air makes me feel infinitely better. This moment is striking in proximity to the scene it follows, in which Jacques and a fellow patient read a poem by Jacques Prévert, “To Paint the Portrait of a Bird,” together. It begins: “First paint a cage / with an open door.” Not a bad metaphor at all for how Jacques has turned the means by which trans lives are repressed, constricted, and/or regulated — like the legal and medical morass she has to slog through, the stereotypes in obnoxiously popular media like Ace Ventura: Pet Detective that she has to combat, and the form of the transition memoir she has to contend with when she is ready to say much more — and made a way out for herself. One of my favorite parts of Trans deals with Jacques’ pursuit of trans-friendly bars and public spaces, a gesture that feels so bold to me, having grown up in a small, conservative area with only the internet to connect me to much of anything. The revelation that several of these spaces were established by a trans woman whose exploitation by the media was a vivid early trauma for Jacques is astonishing — the woman not only persevered, she made spaces where it was possible for Jacques to be herself. With Trans, Jacques achieves the same kind of sanctuary-building. When she asks herself for whom she is writing this account, she thinks about her ten-year-old self, “not knowing where to begin in the search for literature about (let alone by) people like me.” Young people like Jacques — who are trans or gender-nonconforming, who love and need art — will find a place for themselves in Trans. Jacques intimates in the book’s afterword that she has written a series of short stories about trans characters, the publication of which cannot come soon enough. I love to imagine a future in which a young trans writer can embrace this book as talismanic and important because it reflects something beautiful and singular, and not because it is one of the only stories in which they do not feel invalidated or erased. Those seeking the kind of story in which they find not only an utterly distinct transgender person living on their own terms — to the extent that any of us are — but also a writer for whom stories are vital, the tone of whose prose changes with the force of a smile at the mention of a favorite song: those readers need Trans now. Kari Larsen is a writer and editor dwelling on the banks of the mighty Susquehanna. More information can be found at www.cold-rubies.com.